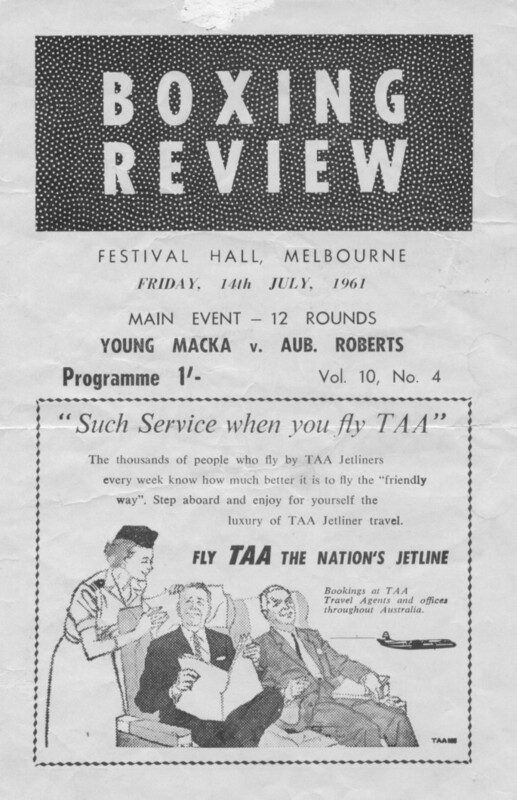 The Boxing Review was a program booklet sold by Stadiums Ltd at the entry doors on fightnights. 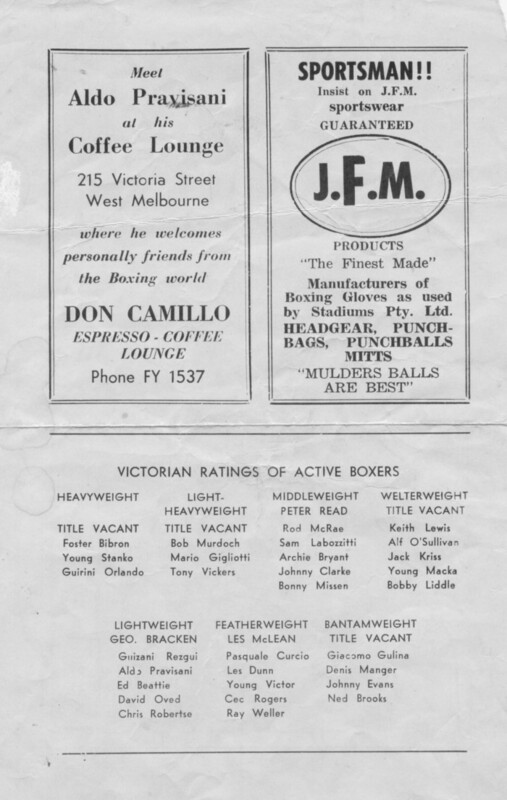 It provided some information about the boxers with Victorian Ratings and the evening's billing. Aldo Pravisani's advert & J.F.M. Newly rebuilt after the old West Melbourne Stadium was burnt down. 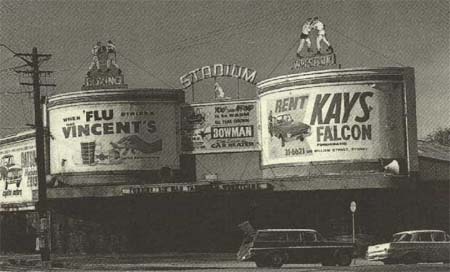 Fights were held at the Fitzroy Stadium while the rebuilding took place. Festival Hall in Melbourne was the place to be seen and the venue of many a sell out sports or entertainment event for decades. Probably best known for staging professional wrestling and boxing matches, many a riot started at The Hall, and some even spilled into the street and parking lot. Festival Hall as is now known - Stadium then and known as West Melbourne Stadium was built by John Wren in 1915. Rebuilt in 1956 after being burnt down the year before, it was the Olympic Games venue for gymnastics and wrestling. In the 1950s and 1960s it became an entertainment centre, with famous appearances including Bill Haley, Frank Sinatra and the Beatles. It was renamed Festival Hall in the latter part of 1959. By the 1990s it had been overtaken by more spectacular venues, but the Wren family remained in ownership. Hugh Donald Macintosh ushered in a new era in Australian Boxing when he leased a Chinese market garden site at Rushcutters Bay on the corner of New South Head Road and Neild Avenue. Here he built the Sydney Stadium to promote a world title fight between Tommy Burns and Bill Squires on 24th August 1908. Burns won this first major competition (although there were a few earlier exhibition matches) by a knockout in the 13th Round. The early big fights proved to extremely popular and profitable. American in Australia due in part to the visit of the United States Great White Fleet to Australia, the novelty of Johnson being Black and a prevailing fear in some quarters that if Burns were defeated it might signal a weakness in what was seen as the Anglo-Saxon Race. This interest encouraged a huge crowd to pay to watch the fight. According to the Australian Encyclopaedia, Johnson was to receive 1,500 pounds but when he saw the full house on the night of the fight he demanded more money. Macintosh forced Johnson to enter the ring a gunpoint. The fight was stopped by police in round 14 when Burns was knocked out, though the referee awarded the fight on points to Johnson. The Stadium was roofed in 1911 and in 1912 was acquired by the sportsman Reginald "Snowy" Baker (1884-1953) and his brother Harald. In 1914, Stadiums Pty. Ltd. was formed with Baker, Richard Lean and the Melbourne based financier and gambler John Wren (1871-1953) as the chief shareholders. World War restrictions closed the Stadium in 1916, and it reopened at the end of the War. 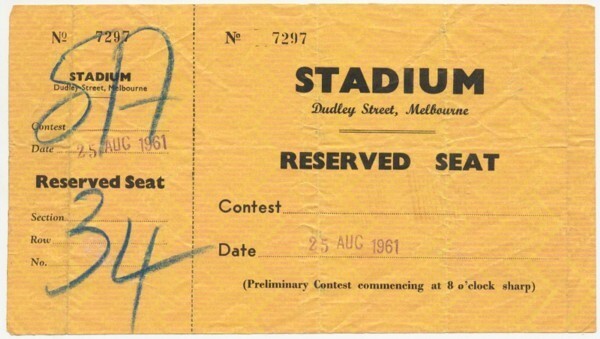 Boxing matches continued to be held at the Stadium until the 1970s, although by the 1950s it was also being used for music and stage productions and for over half a century was an important part of Sydney's popular culture. 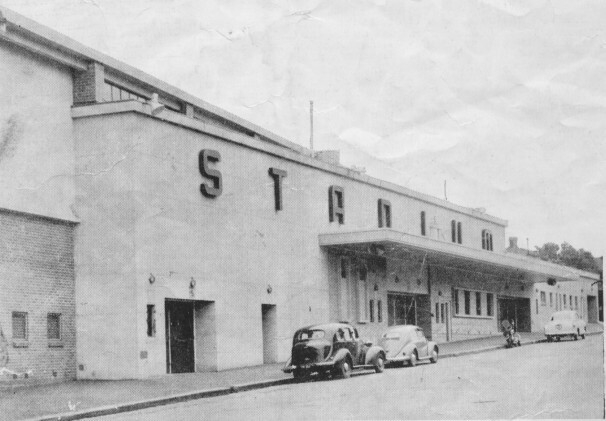 The Stadium was demolished in 1973 to make way for the overhead section of the Eastern Suburbs Railway. Its former site is marked by a plaque. Paul Convy - March 1996. Stadiums Limited and John Wren and my tribute. GOOD OLD DAYS never to be seen again.